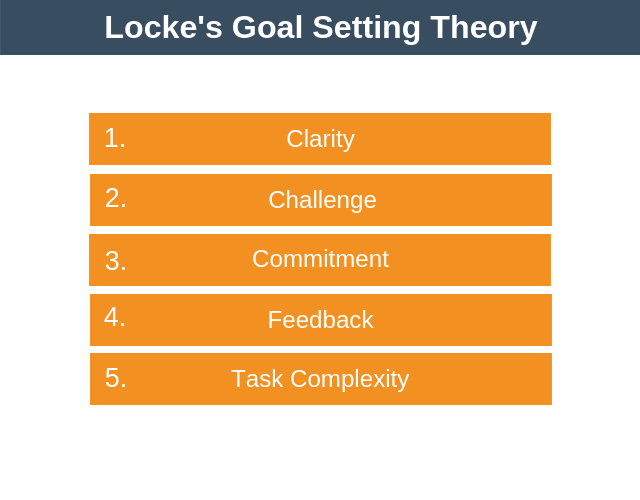 Locke’s Goal Setting Theory is a great framework to use when setting goals for yourself or for your team. The theory is based on research showing that with the right goals your can increase both productivity and motivation. Locke and Latham were able to demonstrate that when you set specific and challenging goals, and receive regular feedback on your progress, then your productivity and motivation will increase. Performance and motivating will increase regardless of whether your job is highly complex or low in complexity. So, whatever job you or your team currently do, Locke’s Goal-Setting Theory can help improve productivity and motivation. 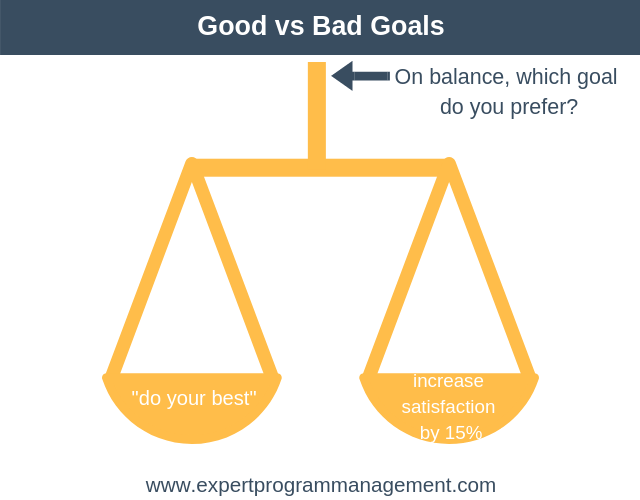 As well as showing the types of goals that can increase motivation, their research also showed how not to set goals. They found that setting unspecific and vague goals failed to increase motivation. Complete your assignment to the best of your ability. It might seem obvious to you that setting vague goals like this won’t increase motivation or performance, but the thing to understand is the first person to realize and prove this was Locke. 1. Goals keep you focused on what’s important. When you get sidetracked you quickly realize that the distraction isn’t moving you towards your goals. 2. Goals make you more persistent. It’s natural to have days where you’re super motivated and other days where things aren’t going so well. Having goals that you’re committed to can give you the determination to push through the difficult times. 3. Goals help you rise to the challenge. If you’re committed to achieving them, then stretch goals can help you to achieve more than you thought possible. Let’s examine each of the characteristics in turn of Locke’s Goal Setting Theory. To be motivating goals need to be clear. When a goal is clear it’s easy to understand exactly what you need to achieve. It’s not open to debate or interpretation. Conversely, when a goal is vague and imprecise, it’s difficult to know if you’ve achieved it. Take a look at the following diagram. According to Locke’s Goal Setting Theory, which do you think is the better goal? Clear: Increase the customer satisfaction score by 15%. Unclear: Do your best to increase customer satisfaction this quarter. Specific: Precise with a single focus per goal. Measurable: Can be measured so that you know when you’ve hit them. Achievable: The goal should stretch you but not be unachievable. Relevant: The goal needs to matter to you. If you’re working within an organization you need to understand how your goal matters to the organization too. Time-Bound: There is a specific deadline by which to complete the goal. Ensure you understand exactly how you know that you will have achieved your goal. Ensure you have a metric you can use to track progress towards the goal. To be motivating goals need to be challenging, but not too challenging. A goal that is too easy to achieve won’t motivate you to up your game and increase your performance. Similarly, a goal that you perceive as way beyond your capability won’t motivate you either. It may actually demotivate you. For a goal to motivate it must hit the sweet spot between challenging you but not over challenging you. Too easy: Increase customer conversion rate from the present benchmark. Too challenging: Increase the customer conversion rate by 700%. Ask yourself honestly if your goal is too easy, to challenging, or just challenging enough. Think about what scenarios might arise to slow down your progress? Plan ahead. Perform some scenario planning to determine how you’re going to push through these challenges if they arise. For a goal to be motivating you must be committed to it. Likewise, if your setting goals for others you need to ensure that they bought into the goal. No Commitment: You decide in a meeting with your boss what your team’s targets will be and then dictate these targets to your team. Commitment: You work with your team to determine together what the targets should be and how they can be hit. Agree that targets are realistic and sensible with each member of your team and ask them explicitly if they buy into them. If any rewards are associated with hitting targets, ensure that they are wanted, desirable, and the process of deciding who gets what is transparent. ERG Theory can help with this. Keep yourself on track by visualizing what it will mean to you if you hit your targets. In order for a goal continue to motivate you as you work towards it, you must receive feedback. Feedback must be received regularly. Both positive and negative feedback should be welcomed. If you are giving someone negative feedback then make sure you do so in a constructive way. Good: Set a team members goals then organize a weekly check-in to monitor their progress. Bad: Set a team members goals then forget all about them until their end of year performance review. Schedule a weekly check-in to monitor progress. Use an app (such as Strides) or a spreadsheet to track progress. Use our Giving Feedback article [LINK] to explore effective ways to give and receive feedback. In order for a goal to be motivating it must not be too complex. Highly complicated goals can be overwhelming and demotivating. Good Target Setting: Break down complex targets into sub-targets. Bad Target Setting: Set a complicated target and simply expect your team member to get on with it. Break complicated tasks down into sub-targets. If you or a team member feels overwhelmed by a target it may be too complex. Consider reassessing the target. The key takeaway from the work of Locke Goal Setting Theory is that goal setting when done correctly can be a powerful tool for boosting motivation and productivity. This applies both when your setting personal goals, and when you’re setting goals for your team. Challenging, but not too challenging. By using Locke’s Goal Setting Theory you can keep your team, and yourself, both productive and motivated.